In this basic recipe, I am cooking the chickpeas with water, bay leaves, garlic, and salt. Feel free to use broth or any other herbs, such as thyme or oregano. If you are cooking the beans with broth, you can save the chickpea broth for soups and stews. 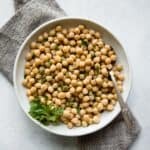 Soak the chickpeas with water overnight or for at least 8 hours. You want to cover the beans with about 2 inches of water. The chickpeas expand as it soaks, so be sure to use a large enough bowl for soaking. Before cooking the chickpeas, drain the water and rinse the beans. STOVETOP METHOD: Transfer the soaked chickpeas to a large saucepan or a small pot. Cover the chickpeas with water by 2 inches. Add the garlic, bay leaves, and salt. Bring the water to boil, then reduce the heat slightly and simmer for 20 to 25 minutes for firmer beans, 40 to 50 minutes for softer beans. SLOW COOKER METHOD: Transfer the soaked beans and cover with 6 cups of water, garlic, bay leaves, and salt to a slow cooker. Cook on high for 4 hours or on low for 8 hours. INSTANT POT METHOD: Transfer the soaked beans, 4 cups of water, garlic, bay leaves, and salt to an Instant Pot. Set the Instant Pot to manual mode, and cook on high pressure for 12 to 20 minutes, depending on your preference. I liked mine at 12 minutes. Once the cooking time is up, let the pressure naturally release before opening the lid. If you are using unsoaked beans, you will need to cook the chickpeas for at least 35 to 40 minutes. Let the pressure release naturally. The beans will keep in the refrigerator for 4 to 5 days. You can also freeze chickpeas for a few months. I prefer cooking the beans with 1 tablespoon of kosher salt. If you are using sea salt, use 2 teaspoons of salt.